The Large Hadron Collider (LHC) at the European Organization for Nuclear Research (CERN)–operators of the world's largest particle physics lab–near Geneva, Switzerland, is said to be the largest particle accelerator in the world. The accelerator lies in a tunnel 27 kilometers in circumference, as deep as 175 meters beneath the French-Swiss border. This, by the way, has helped scientists uncover the Higgs boson, the last particle predicted by the Standard Model in 2012. Following the discovery of Higgs, a primary scientific goal of high energy physicits has been to characterize the properties of this new particle and to discover oher high-energy physics phenomenon. As a result, there have been some rapid developments in high-energy particle accelerator technology to support high-energy physics research. However, the technologies used to date can only be improved and expanded at great expense. For this reason, making high-energy accelerators more affordable is urgently needed. An international team of physicists, working on the Advanced Proton Driven Plasma Wakefield Acceleration Experiment (AWAKE) at CERN, reported that they have conducted a groundbreaking experiment demonstrating a new way of accelerating electrons to high energies — one that could dramatically shrink the size of future particle accelerators and lower their costs. A paper describing this important result was published in Nature on August 29, 2018. AWAKE is an international scientific collaboration, made up of engineers and scientists from 18 institutes, including CERN and the Max Planck Institute for Physics in Germany. A UNIST-based research group, led by Professor Moses Chung in the Department of Physics is also part of this AWAKE collaboration and made a number of important contributions to AWAKE. This includes the design of beamlines and the optimization of electron beam injection. 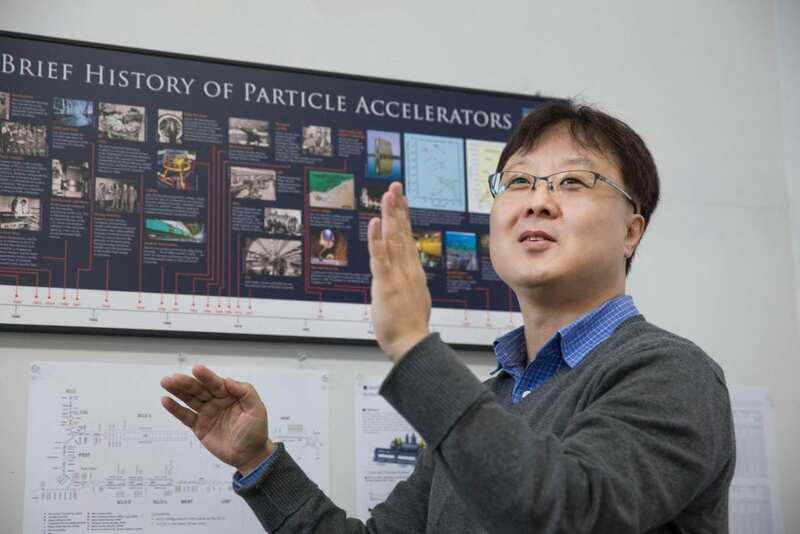 "AWAKE's technology will bring about a paridigm shift in the development of future high-energy particle accelerators, following LHC," says Professor Chung. "The latest achievement could enable engineers to drastically reduce the size of future particle accelerators, cutting down on the vast amounts of money normally required to build them." He adds, "The high-energy particle collisions these facilities produce enable physicists to probe the fundamental laws of nature, providing the basis for advancements in a huge variety of different fields." Typically, particle physics experiments use oscillating electric fields, called radiofrequency cavities, and high-powered magnets to accelerate particles to high energies. But these experiments must grow quite large–they have to be, in order to accelerate particles with enough energy to properly study them. As an alternative cost-cutting option to accelerate particles more efficiently, the wakefield accelerator has been suggested. Physicists send a beam of either electrons, protons, or a laser through a plasma. Free electrons in the plasma move toward the beam, but overshoot it, then come crashing back, creating a bubble structure behind the beam and intense electric fields. If you inject particles, like more electrons, into the wake, it can accelerate the injected particles in a shorter amount of time with an electric field 10 or more times stronger. In the study, proton-driven plasma wakefield acceleration has been demonstrated for the first time. The strong electric fields, generated by a series of proton microbunches, were sampled with a bunch of electrons. These electrons were accelerated up to 2 GeV in approximately 10 m of plasma and measured using a magnetic spectrometer. This technique has the potential to accelerate electrons to the TeV scale in a single accelerating stage. Although still in the early stages of its programme, the AWAKE collaboration has taken an important step on the way to realising new high energy particle physics experiments. This research has been supported by the Individual Basic Science & Engineering Research Program and Global Ph.D. Fellowship (GPF) Program through the National Research Foundation of Korea (NRF). E. Adli, et al., "Acceleration of electrons in the plasma wakefield of a proton bunch," Nature, (2018).